Bladder cancer treatment usually depends on where in the bladder the cancer started, and how far it has progressed (i.e., th"stage"). While some may patients may only need one treatment type, others may benefit from a combined approach. Bladder cancer can spread to nearby tissues or other parts of the body (including the lungs, bones, and liver). The main treatment options for bladder cancer are surgery, chemotherapy, biological therapy, and radiation therapy. Transurethral resection of bladder tumor (TURBT) is used during the earliest stages of bladder cancer, when cancer is found only on the bladder's inner lining. During this procedure, the surgeon inserts a cytoscope (a hollow tube with a lighted camera at its tip) into the urethra and up to the bladder. A cutting instrument is slid through the tube and used to remove the cancer. During open surgery, a cut is made in the abdomen to remove the cancerous tissue. If the bladder has only a single, small tumor, a surgeon may remove only the affected part of the bladder (partial cystectomy), as well as any affected lymph nodes. Partial cystectomy leaves the bladder smaller, thus unable to hold as much urine. While urine storage can improve over time, reconstructive surgery can also help. For more advanced bladder cancer—such as when the disease has invaded the middle layer of the bladder—the entire bladder may be removed (radical cystectomy). If the disease has advanced to the lymph nodes, the affected tissue from those regions must also be removed. Urostomy: Part of the small intestine is used to create a tube that carries urine through a hole in the skin to an external collecting bag. Continent diversion: A piece of the stomach or large intestine is used to create a pouch inside the body—near the site of the removed bladder—that collects urine from the kidneys. The pouch may be connected to the abdominal wall through a small hole (stoma), or surgically attached to the urethra (the tube that carries urine out of the body). Chemotherapy drugs, such as cisplatin or doxorubicin, kill bladder cancer cells and are often used in conjunction with surgery. Theseagents—given intravenously, by mouth, or injected directly into the bladder—are designed to attack any rapidly dividing cells, so they also affect hair follicles, bone marrow, and the intestinal tract. As a result, the drugs cause side effects such as bruising, bleeding, hair loss, digestive issues, and increased susceptibility to infections. Biological therapy uses laboratory-grown bacteria—based on the body's own natural biological response modifiers— to encourage the immune system to kill the cancer cells in the bladder. The bacteria are fed into the bladder through a catheter inserted into the urethra. Following treatments, the patient will be expected to hold the liquid in their bladder for around two hours to give it time to work. This form of therapy may keep the bladder cancer from returning and is usually done once a week for several weeks after a transurethral resection. With radiation therapy, high-energy rays (radiation) are aimed at the bladder to destroy the cancer cells. 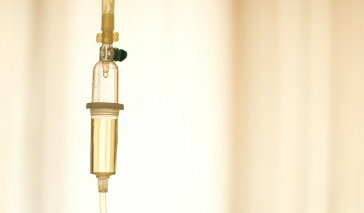 This treatment may be given instead of, or combined with, surgery and chemotherapy. Those who are diagnosed with superficial bladder cancer can often be cured, with a five-year survival rate ranging between 55 and 80 percent. If the cancer is more invasive, radiation therapy, surgery, or a combination thereof have a five-year survival rate ranging from 30 to 75 percent, depending on how far the cancer has moved into the bladder and surrounding tissues. The 5-year survival rate once the disease has spread to the lymph nodes or distant parts of the body is 10 to 15 percent. Bladder Cancer Treatment. (2013). National Cancer Institute Online Publication. Wood DP. (2011). Urothelial tumors of the bladder. Campbell-Walsh Urology, 10th. ed. What you need to know about bladder cancer. (2010). National Cancer Institute Booklet. NIH Publication No. 10-1559.